Imagine a beautiful deck with stunning views all around. Imagine it with multiple levels and enough seating for all your friends and relatives. See it as a place to relax and unwind after a long week at the office. See it as a place of beauty, where furniture, pots and plants, and even outdoor kitchen appliances are ready and waiting to help you enjoy everything about your home on a whole new level. Now imagine it all in the dark. As often as weather permits we head outside on a nice sunny day and sit back and relax. However, as the sun goes down it becomes far less likely that we will want to or be able to enjoy our outdoor living spaces… unless we have lights! Doing deck illumination well is not as easy as just throwing up a floodlight. Yes, a floodlight would do the trick. We could light up the entire backyard with one that was powerful enough, but that’s not conducive to the ambiance most of us are trying to create in our home environments. We want class. We want style. We want a place we can enjoy. And that means choosing the optimal deck lighting for your home. Choosing the right lighting for your home means choosing attractive, well-placed lighting that not only makes it more inviting, but safer too. And, did you know you can find it at a lumber store? There are many types of fixtures that make perfect additions to your outdoor living arrangements. You’ll find fixtures perfectly suited for railings, posts, and even stair risers. Some products are even specifically created by decking and railing manufacturers for builders to install while completing your decking project. And many lighting fixtures aren’t difficult to wire or risky to have in place. Any unlit areas around your deck are considered hazards, but throwing light on the situation needs to be done right to avoid creating other issues. It is important that downward-facing deck lights do not shine in someone’s eyes as they move between levels. Using purposeful, directional lighting can provide concentrated light for assured footing while avoiding unintentional glare. You can accomplish this through several different styles. Rail Lights – Rail lights are low voltage side-mounted lights that add glow and ambiance to your outdoor area. They come in multiple styles and allow you to customize any way you choose. Step Lights – Step lights are recessed lighting options that blend in perfectly with your stairs. They add safety and harmony to the rises of your deck. Post Caps – Post Caps add the finishing touches. They are designed to be placed on top of the railing, used as accent lighting along the rails. Keep in mind that they are several feet off the ground and used more for creating ambiance than for lighting your walking path. When you think of outdoor lighting, chances are you think about soft lighting. 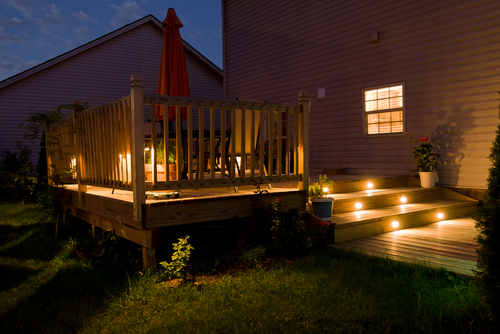 In the past, lights for decking have typically been halogen or xenon lamps, both of which are incandescent. Xenon bulbs aren’t as bright as halogen, but they can last up to 20,000 hours, giving them an edge in demand. Xenon bulbs can also be handled with your bare hands without shortening the bulb life. The color temperature is a bit warmer and is less likely to discolor plastic lenses that come with most deck lighting fixtures. However, today LED lighting is becoming the new norm. An LED may last up to 50,000 hours before the light falls to an unacceptable level. And most LED lights produce far more lumens per watt than their incandescent counterpart. But LED lights burn at a higher color temperature, which gives it a bluer cast. Technology is improving and lenses are being used to help soften LED light to match people’s expectation for outdoor lighting. As more manufacturers move to LED, better appearances and more energy efficiency are going to make a difference. And as more become readily available to you, it will equate to a lower price-point. Most deck lighting systems run on a 12-volt current, not the 120-volt current used for your indoor household lighting needs. There’s a reason for this. Low voltage systems are safer and use less energy. If functional output and safety are high on your list for a particular area of your deck, choosing lights that run on hard-wired electricity versus solar makes sense. Solar powered options have the advantage of convenience, but solar cells also have several disadvantages. The batteries run low quickly and usually need to be replaced after 500 charge cycles. And in long stretches of cloudy or stormy weather, the light they put off will be minimal, at best. If consistent lighting is needed, hard-wired electrical is the way to go. How you control lighting depends on the purpose. In most cases, individual lights aren’t switched on; they are controlled by joint circuits. However, if you need directional lighting near a grill, for example, it might be best to control it by a separate switch. For safety, lighting at stairways might come on whenever it’s dark, controlled with a photo-sensor that switches on and off at dusk and dawn. Thinking about the purpose of each light and how it will be turned on and off is an important consideration before installation. Lighting is an essential part of creating the perfect ambiance with your outdoor living space. Adding lights add value to your deck and home by making it safer and more useful, and gives you more reason to use your outside space all year long.